Advanced Fantasy Baseball: Martin Prado: Best Hitter in the National League? I found something odd inside last week's Baseball America. On page 15 they printed the results of their survey of major league managers of the best tools in baseball. Most of it was fairly predictable. The best National League baserunners were Michael Bourn, Nyjer Morgan and Andrew McCutchen. The most exciting players in the American League were Carl Crawford, Josh Hamilton and Ichiro Suzuki. And the best hitters in the National League were Albert Pujols, Joey Votto and Martin Prado. Say what, now? Martin Prado? It's true that Martin Prado has been extremely good over the last couple of years. First as a utility player and finally as the full-time second baseman. Dave Cameron of FanGraphs.com had good things to say about him during his Trade Value series of articles in which Prado ranked at number 47. The ultimate performance over tools guy in the big leagues right now, Prado’s success is a testament to how pedigree doesn’t mean everything. This is a guy who hit 15 home runs in 2,119 minor league plate appearances, and was simply not considered much of a prospect when he got to the big leagues. However, for the last three years, he’s been one of the best second baseman in baseball, adding some power to his already good contact rates and turning himself into a legitimate All-Star this season. He’s headed for his prime years as an already good player, and the Braves have him under control for three more seasons. He might be the most unexpected guy on this list, but he’s earned his spot here. By wOBA, Prado comes in an impressive seventh among second basemen this season with an extremely solid .368 score. He ranks 22nd in wOBA in the National League, which is impressive for a player that was not expected to become an offensive force. At the time of this posting, Prado held a slash of .317/.360/.488 with 15 homeruns, 89 runs scored, and 58 RBI in 498 at-bats. Although his walk rate is unimpressive at just 6.4 percent, he has shown incredible patience at the plate. He swings at far fewer pitchers than most major league hitters both in and out of the strike zone. He also makes far greater contact. He is definitely a skilled hitter. The key to his transformation seems to be his steadily increasing power. The last three seasons have seen his ISO go from .140 to .158 to .171 this season. Although most leagues do not bother with defense, I thought it would be interesting to see how he has been with the glove. The answer is pretty good overall. He's been excellent at third base just passing at second base but showing some improvement. I think this helps us call him a pretty good third baseman and a very good second baseman. Unfortunately, the major league managers seem to have elevated him a bit past his true skills as a hitter. He is definitely a player worth watching for fantasy purposes. At 27-years old with experience we may see him take another step up and into the true tier of best hitters in the National League. But for now I would still place players like Albert Pujols, Joey Votto, Matt Holliday, Ryan Zimmerman and Hanley Ramirez in a class above him. 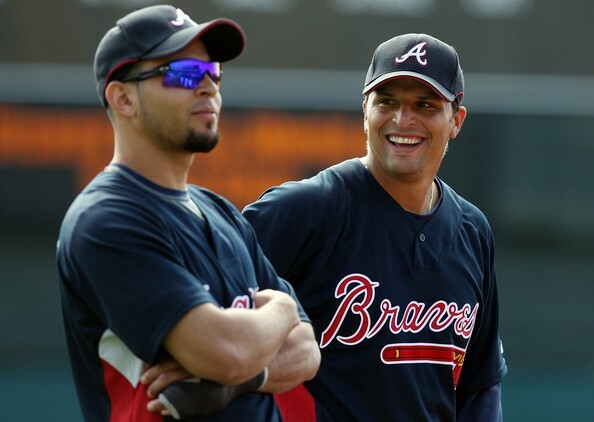 How has Martin Prado helped in your quests for gold. Are you ready to label him one of the best hitters in the National League? Let's hear about it in the comments section. Prado was a key part of my championship run last year and I actually thought about keeping. I didn't unfortunately. This season he was actually drafted earlier than I expected and has gone on to pay big dividends for his owner. You have a guy whose useful but only a borderline keeper, then he explodes for some one else. I remember being pissed that he's taken the job of my Kelly Johnson last year. Who I released when he was released. Bad move ultimately.